palt() and how it can be utilized. the command is used to render colors as transparent when sprites or graphical commands are used. This command also avoids any other edits to the palette that are initiated in the code used. syntax for palt is simple: first parameter chooses color to render transparent or not, second parameter is boolean and decides for the color to be transparent. palt( x , true ) would make the color x not render. this should be a useful command when using another color as transparency. 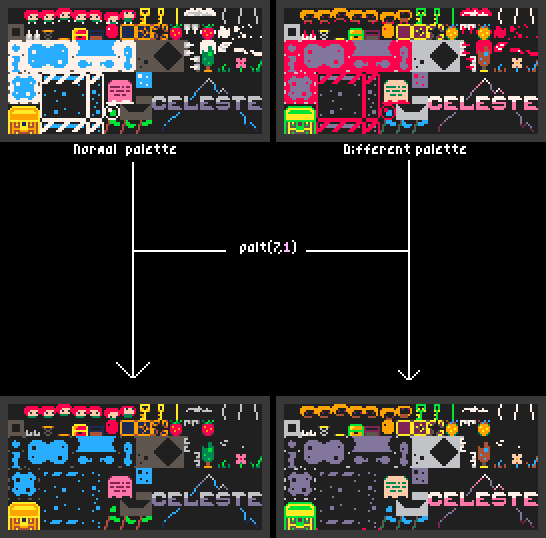 I want to show you how sprite packaging [as i call it] can be utilized in pico8, to provide for bigger sprite space for sprites that containt up to 4 colors. The most efficient way i get 4 sprites from one is to stick them together and draw them as if they were different sprites. I stick colors in a blending program which forces one color to be its next, and this way of combining sprites work very well for me. And I don't know what else to add but that by using sprite packaging, you can get 512 sprites that have two colors, and 256 for sprites with four. That sprite packaging!! You have no idea how much this helps me! This is great, thank you very much! !